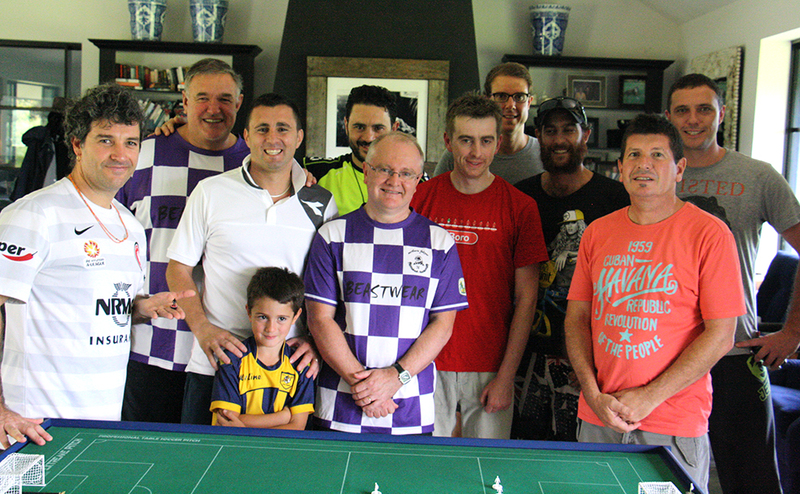 Subbuteo Parramatta went on the road for this FISTF/WASPA tournament, heading down to club member, Raffaele Lombardi’s home town of Berry. The glorious sunlit day filled the room for the players to face off – some of the old regulars against some old champions who’ve recently returned to the game, as well as some novices to bring renewed enthusiasm. Group 1 turned out to be where a lot of the action would be – both grand finalists as well as the repechage winner fought out the group stage. Daniele Lombardi was overwhelmed in his matches against Peter Thomas and former Australian junior champion Will Johncock. Their encounter against each other was a cagey affair, ending 2-1 to Peter. Group 2 saw Eliot Kennedy down Adrian Elmer 2-0 in the first match, Adrian defending doggedly for the opening 15 minutes before letting himself down with some poor play and 2 conceded goals in the opening couple of minutes of the second half. New boy Mat Barrie then did the same to Adrian, Mat’s reading of the game serving him well until Adrian finally managed to break through midway through the second half. Eliot’s experience was too much for Mat in the final game. 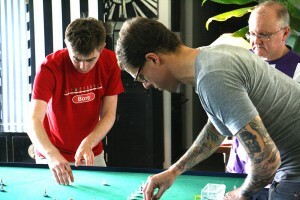 Opening round games – Paul vs Adam in the foreground, Steve vs Raffaele behind. Group 3, the only one with 4 players, was also the group that could go down to the wire, which it did. An opening 1-1 draw between Steve Dettre and Raffaele Lombardi could have gone either way, with each player having a golden chance to take the game in the final minute alone, a draw, however, being a fair reflection. Paul Magee got warmed up with a win over the other new boy, Adam Reynolds. Steve accounted for Paul in the second round, while Raffaele dispatched Adam. 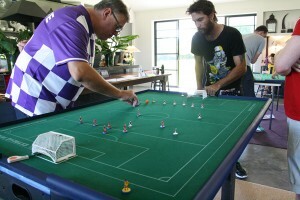 In the final games, the biggest celebration of the day happened when Adam scored his first ever competitive goal – a well placed finish against Steve – though Steve kept control, winning the game. Paul knew he needed to beat Raffaele to progress to the knock-out stage but, in the end, had to be content with the repechage after Raffaele saw him off 2-0. Adam takes on Steve in the group stage. The repechage semis saw the experience of Daniele and Paul win out over the new players, Mat and Adam though Mat, again, showed a deft defensive line and made Paul work hard, while both players brought an enthusiasm to the dy and willingness to learn that will see them progress quickly. In the final, two very different styles fought out for supremacy with Paul’s calculated precision rubbing up against Daniele’s flamboyance. Paul took the lead, while Daniele had thought he had equalised with a deft shot before realising he had a figure off-side. In the second half, Daniele pressed hard and finally found the net with a swift series of flicks on the run to bury the ball. As the game looked like heading for extra-time, Daniele took the lead, another swift manouvre and powerful shot giving him the repechage title. In the barrage rounds, Steve took a comfortable 2 goal to the half-time break over Adrian, but Adrian got into the game much more in the second half, pulling one back and coming close a few more times. Steve’s experience, however, showed through as he made sure of his place in the semis with a 3rd. Will defeated Raffaele 3-1 to take the other semi, meaning the 3 seeded players were in the semis, joined by the the former junior champion playing his first tournament after an almost 20 year lay-off. While Steve had his moments, Peter took an early goal in their semi, which allowed Peter to settle and dominate. His third goal, in particular, was an absolute screamer, scored by a deep, defensive figure piercing the smallest gap to get a venemous shot on target. Meanwhile, Will was pushing Eliot all the way, Eliot unable to turn field position into scoreboard dominance. 1-1 at full time meant the first (and only) extra time of the day was needed. This turned into an almost non-event, though, as, barely had the extra period started and the audience settled in to watch the tussle, than Will scored a well taken golden goal winner, giving him a rematch against his group opponent, Peter. Peter piles on the pressure against Will in the grand final. Having learned a few things from their earlier encounter, Peter played a perfect opening and was 3-0 up inside 5 minutes. An earlier comment about an extra pie that Will had eaten at lunch came back to haunt him as he appeared unable to move in the face of Peter’s quickfire attacks. He did finally settle, though, and was able to head to the half-time break without conceding again. Midway through the second half, however, Peter put the result beyond doubt with a knock-out blow 4th goal. Will did get some possession and pulled back a well-taken consolation, before Peter rounded out a convincing performance with 2 more to take the game 6-1. 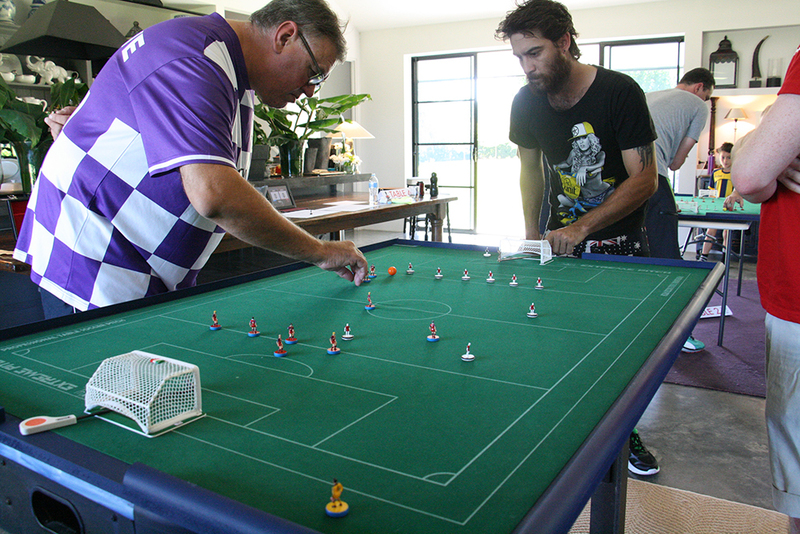 A fantastic day of Subbuteo, played in sublime surrounds with great sportsmanship on display at all levels. It was great to see new and returning players throw themselves at the challenge with enthusiasm, while the regulars continued their onfield duels with each other with both competitiveness and camaraderie. To see the full results click here. This entry was posted in Tournament reports and tagged adam reynolds, adrian elmer, berry, daniele lombardi, eliot kennedy, fistf, mat barrie, paul magee, peter thomas, raffaele lombardi, steve dettre, subbuteo parramatta, will johncock on 31/03/2015 by ajebec.